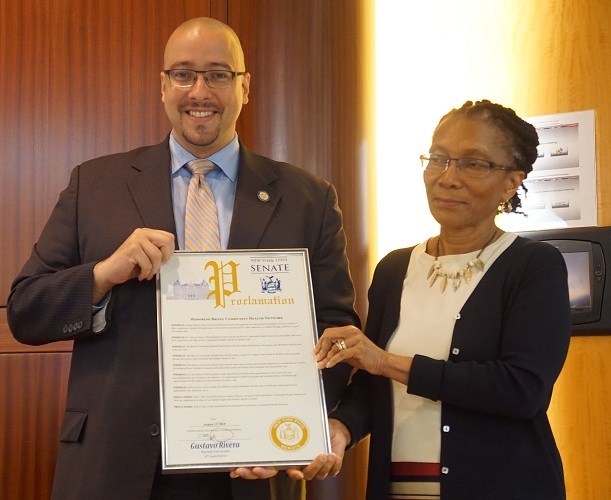 NY State Senator, Gustavo Rivera presented BCHN with a proclamation during the recognition dinner. Pictured with Rivera, Eleanor Larrier, BCHN CEO. 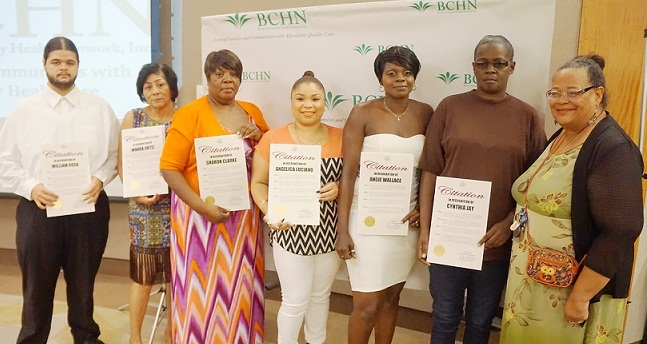 BRONX, N.Y.— In celebration of National Health Center Week, Bronx Community Health Network, Inc. (BCHN) held its 10th Annual Community Health Champions Recognition Dinner to honor BCHN’s health educators, nutritionists, patient navigators, and patients from each of the 17 affiliated health centers. The champions recognized during this year’s recognition dinner accomplished significant health goals including weight loss through exercise and changes to diet, as well as general health management in order to control chronic conditions such as diabetes. 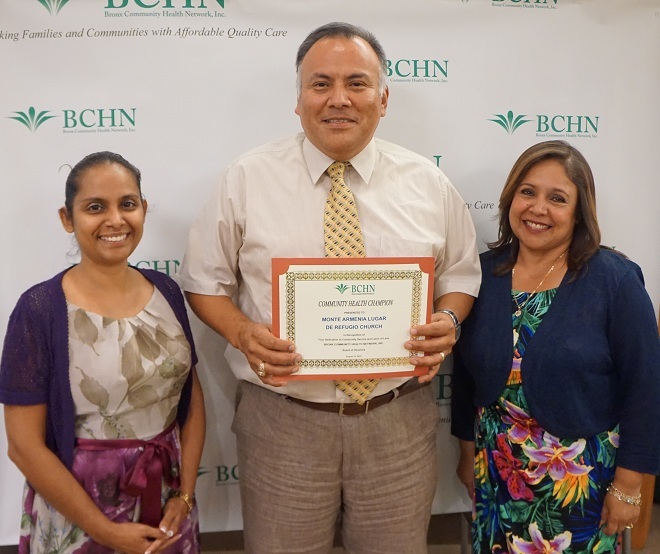 Health Champions honored by BCHN for their accomplishments. Two such individuals who were honored were William, a patient from the Montefiore University Avenue Family Practice, and Cynthia, a patient from the Claremont Family Health Center. and his wife First Lady Pastora Reyna Martinez. During a consultation with a health educator last year, William weighed more than 290 pounds. His health educator Nereyda Franco, MPH, MCHES, CLC, discussed the potential risks for chronic health conditions due to his weight. Since that initial conversation, through a change in diet and exercise; to date, William has lost nearly 40 pounds and is still going. He has also gained the confidence to make other positive changes in his life, including going back to college. Since 2006, Cynthia has been working diligently to improve and maintain a healthy lifestyle. She sets a positive example of how to take control of one’s health. Cynthia adheres to a strict diet and maintains physically active, and works closely with her health educator, Melissa Moreira and her other health care provides to make sure everything regarding her health is on track. 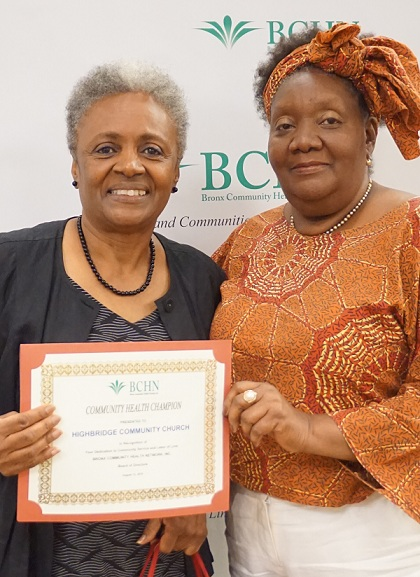 BCHN’s celebration also marked with the 50th anniversary celebration of the founding of the development of the first two community health centers that stemmed from Lyndon Johnson’s War on Poverty, and the Civil Rights Movement.